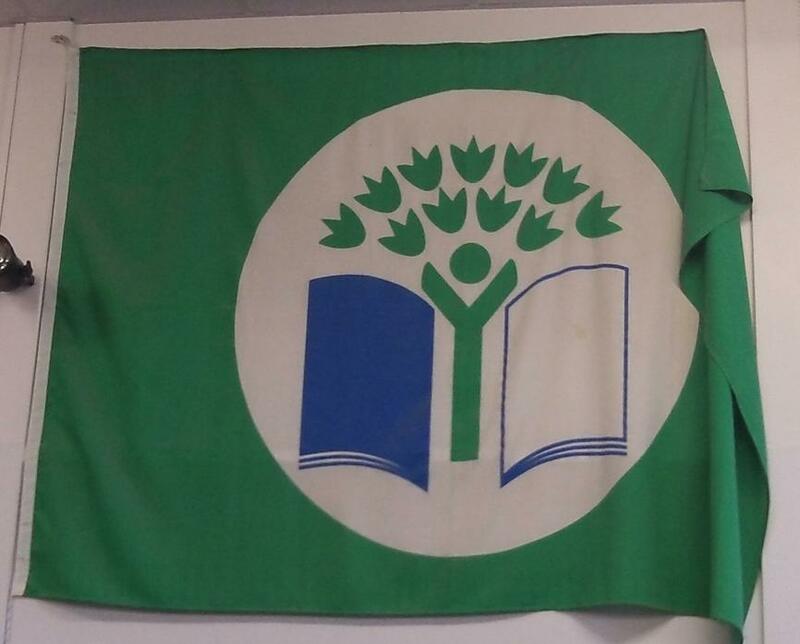 Our school is very proud to have been awarded it's 6th Green Flag, which is a national award scheme managed by Eco Schools. First awarded in 1998 and then renewed 5 times, most recently in January 2015. To achieve this award we were inspected to make sure we had an Eco Committee and an action plan to improve Recycling, Re-Using and Reducing waste and energy within the school, that we spent time in our curriculum developing ‘Eco’ themes and that our actions were having an impact on our school , local and global community. Our approach to being an Eco School is much more than collecting awards, it is about fostering attitudes and behaviours in the children in order to look after the world today for tomorrow. This is in keeping with the schools vision of care ( Care for oneself, care for others and care for the world). We take every opportunity, through the curriculum and life of the school to develop the children’s interest and awareness of how to reduce any negative impact on the environment and increase attitudes of stewardship towards both the environment and community. It affects the choices the school makes when purchasing products and services. We have an Eco Committee linked to the school council, a Forest schools approach to learning and the curriculum, and active engagement with local and global community events. Our school grounds are full of special wildlife areas, composting areas, raised beds for growing fruit and vegetables, food used for cooking within the Curriculum. The school has long standing links with St.Clements House, The Church of the Good Shepherd, Grange Juniors, Farnborough Sixth Form and the Salesian College locally. We build bridges and fosters a sense of pride and belonging in the community we are apart of . The school takes part in Education for all day and encourages children to campaign for the children's Rights to be upheld Globally. We work towards being good citizens of the world today and in the future.